West African Asante folktale with bold illustration inspired by shadow puppets. 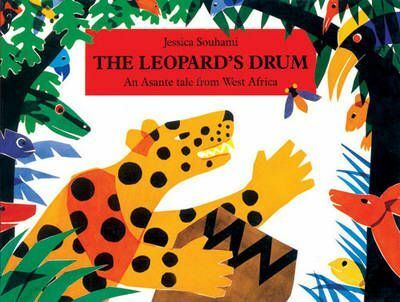 Osebo the leopard has a fine drum, a huge drum, a "magnificent" drum. All the animals covet Osebo's drum, but he won't let anyone else have it, not even Nyame, the Sky-God. So, Nyame offers a big reward to the animal that brings him the drum. All try - the monkey, the elephant, even the python - and all fail. Can a very small tortoise succeed in outwitting the boastful leopard? Jessica Souhami's vibrant collage illustrations, full of movement and humor, add additional appeal to this delightful story. The short, rhythmic text is perfect for reading aloud.